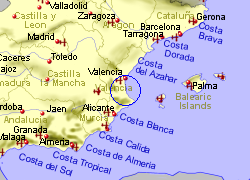 The large town of Alzira is situated 15 Km inland from the Costa del Azahar and 35 Km south of Valencia. This town, built on the banks of the River Júcar, with a number of attractive parks, became important during the time of the Moors who built a high wall round it, part of which remains today together with some historic buildings. Although in an agricultural area (mostly growing citrus fruit) the Alzira has also become an important industrial town in recent years. 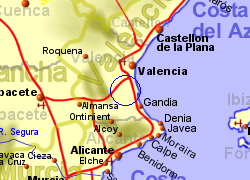 The town sits on the railway line running from Valencia to Alicante, between the A-7 and Ap-7 motorways. 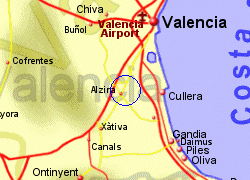 Map of the Alzira area.